In a service business, the real key to success are its people. 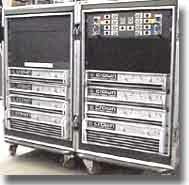 Stirling Audio's staff have experience at every level of the sound system industry. Whether your business is concerts, tours, special events, political rallies, sporting events, fund raisers, corporate or legitimate theater, dinners, dedications, or graduations, we've provided quality systems and services to all these types of jobs.